1. Season short ribs with salt and pepper, add 3 tbsp. oil to pan and when hot, brown short ribs on all sides. 2. Remove meat and saute all vegetables and herbs with salt and pepper to taste for 3 minutes then add tomato paste and cook for additional 2-3 minutes. 3. Add wine, bring to a boil then add stock or water. 4. Add short ribs, cover and cook for 2 1/2 - 3 hours until meat is tender (and falling off the bone). 5. Pull meat off bone and shred into bite size pieces. 6. Strain gravy and discard vegetables and fat Potato Gnocchi 2 lbs. baking potatoes (ie. Idaho Russets). 1. Bake potatoes for 45 minutes - 1 hour at 350 degrees F until soft and while hot scoop out. 2. Grate potatoes into bowl and create a well in center, add eggs and salt and gently mix together. 3. Slowly add flour 1/3 at a time. Kneed together until tacky (stick to table). 4. Make 6 equal pieces and roll into 1/2 inch dowels and cut into 1/2 inch pieces. Dust with flour as needed. 5. Cook in salted boiling water for 90 seconds until floating and cool in ice bath to stop cooking process (yield about 70 pieces). 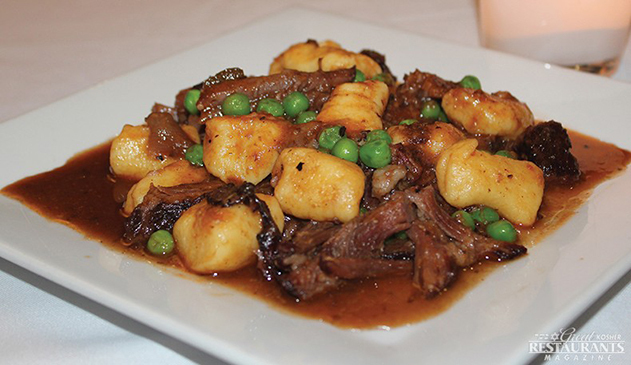 Mix the gravy, pulled beef, gnocchi and peas for 5 minutes until hot - season salt and pepper as needed.